Obama’s ‘Balanced Approach’ is, well… UNBALANCED | Virginia Right! President Obama’s speech last night was unremarkable and predictable. The only thing new was the number of times he used the phrase balanced approach. In fact, he used the phrase 8 times! Apparently, this phrase polls well among the masses. But attempting to disguise his more of the same spending spree as balanced is the very definition of audacity. Obama still wants to spend America out of a spending crisis, which is a bit like giving a drowning man more water. Obama is hoping that Americans remain ignorant of the truth. The president’s theory that we have a revenue problem (which means he wants more taxes) would be true if we had too little government to effectively run the country. Only if we needed more government employees to carry out the basic Constitutional functions of the Federal Government could it accurately be said we have a revenue problem. A recent report revealed that Obama has a staff of 487 people working in the White House alone! And since the current recession started, the only growth area in jobs created has been federal jobs. In the private sector, the deterioration of jobs continues with jobs lost far outnumbering jobs created. So, with the growth of government jobs, reportedly nearly 15%, what services are we now receiving that we were not prior to the beginning of the recession? Obviously, the answer is none. Many of these new government employees are actually charged with enforcing the very regulations and oppressive mandates that are responsible for the job losses in the private sector. So Obama wants to raise taxes on the wealthy and “cut spending”. He also wants to add more debt to the backs of Americans. How is this balanced? The “Bush Tax Cuts” passed in 2001. Obama and the left blames the Bush cuts for today’s economic problems. If only the Federal Government had more revenue, we wouldn’t be in this mess. The graph tells the revenue story. The green bar represents how much revenue the Federal Government brought in, and the red line represents how much more the Federal Government spent above what they took in. The slight dip in revenue after 2000 is where the Bush Tax Cuts were implemented. There was a recession, of course, but the tax cuts actually increased federal revenue to record levels. Unfortunately, spending also increased as evidenced by the growing red tips on the top of each bar. The last 3 years, under Obama, the red ink has exploded. Revenue is growing again, but unfortunately, the Obama spending is absolutely out of control. With tax revenues on the rise, there is no need to increase taxes on anyone! As the graph shows, the problem is that spending has far outpaced the revenue. The chart clearly shows that revenue dipped during the recession in 2001 – 2003, but the recovery that followed, coupled with the tax cuts actually provided more tax revenue to the government, not less as the left claims. 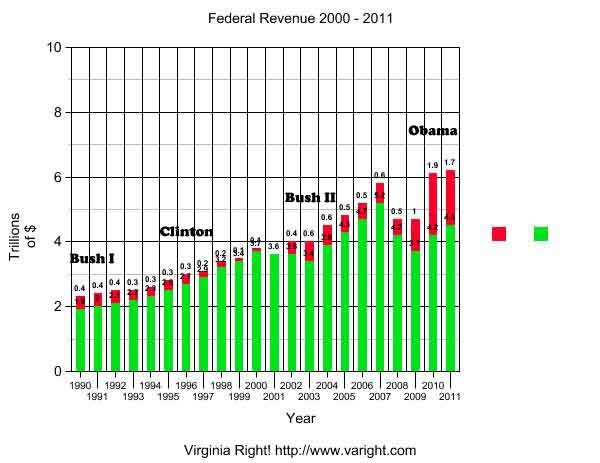 In fact, revenue was going pretty well until the Democrats took control of congress in 2006. The very next year, revenues took a dramatic drop. Interestingly, the Bush presidency saw a steady deficit his entire term, around $500 billion each year – a horrific and irresponsible number that is dwarfed by the trillion dollar and up deficits from Obama – even though revenue is on the rise! Since Obama took office, the spending has increased dramatically. No, Mr. President. We do not have a revenue problem. Revenue is tracking upwards again. And it is best not to endanger this trend with increased taxes. We have a spending problem. The red ink that this administration has added over and above revenue is unsustainable. Cut, Cap and Balance is the only option. And it is, indeed, balanced. ← MIGHT RON PAUL WIN THE AMES STRAW POLL? YES HE MIGHT!